I wanted to share some of the things that have come into my life specifically because I have a baby that I unabashedly endorse to all my friends*. There are lots of great things that I will share about here, but the first thing that came to mind when I was thinking of something that I use EVERY DAY was Badger Balm's Diaper Cream and Baby Balm. Badger is a wonderful company that was started by a family in New Hampshire back in 1995 when the father, "a carpenter by trade and an herbalist by avocation" whipped up a simple, but effective healing balm for his cracked, dry hands out of Extra Virgin Olive Oil, Beeswax, Castor Oil, Aloe Vera and Essential Oil of Sweet Birch. You can read more about how the company started here. Their diaper cream is made with a similar ingredient list but has 12% Zinc Oxide; which most diaper creams have to help with diaper rash. But most diaper creams don't use PURE mineral Zinc Oxide like Badger does, rather they combine it with other chemicals which may or may not be good for baby's skin. I try hard not to be too arbitrary with my attempts to use natural products for Little G...but this stuff just makes the choice so easy! The other ingredients in the diaper cream are Organic Extra Virgin Olive Oil, Organic Castor Bean Oil, Natural Beeswax, Organic Calendula Extract and Organic Essential Oil of Roman Chamomile. The latter two really combine to make a heavenly, light scent. 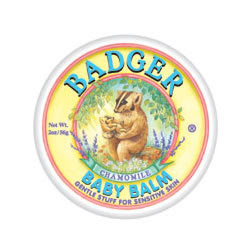 The Badger Baby Balm is made from the same exact ingredients...it just omits the Zinc Oxide. But most importantly, this stuff really works. 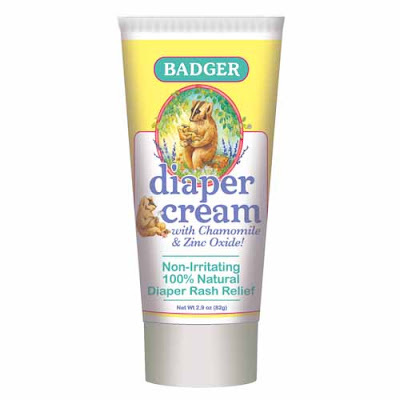 Little G has had his issues with diaper rash and the Badger Diaper Cream always clears it up. And we have used the Baby Balm for everything from helping clear up his cradle cap, soothing his dry skin on *all* his cheeks :P, and even as a massage cream. Little G seems to really like when we put some on his face, so my guess is it feels good to him too. We are actually running low on the Diaper Cream and my husband pointed out the plethora of other diaper creams that we received with various gift baskets...but I plan on donating them to our local Good Will....I figure it is silly to mess with what works! *I hope to write about these things at least once a week and it is super important to note that I am not being paid for these endorsements. The companies represented in my endorsements have no idea I am writing about them and I am only writing about them because I personally use the products and want to share the experiences and tips with my readership. Mr T and I have decided that the baby can attend any college she wants, as long as it's one of our Alma Maters. So of course we needle each other constantly about WHICH school she'll attend. I am pushing Wisconsin (the Badgers), so think I need to start rubbing her down with Badger Balm, stat!